Although not generally considered as serious as many other addictions, sugar addiction can cause a number of very serious health effects if corrective measures are not taken. Why Is Sugar Addiction a Problem? From cupcakes to pies to iced coffee drinks, sugar is found in many foods and is almost impossible to avoid. Emotional or psychological dependence on sugary foods and drinks, also known as a sugar addiction, are a real cause of concern for health officials in America. Processed foods and refined grains create additional sugar in the body once the body metabolizes the food. Sugar in moderation is not harmful; however, many overdo it. A recent study suggests Americans eat way too much sugar. To be specific, approximately 75% of Americans eat excess amounts of sugar, many of whom could be classified as having a sugar addiction. How Do People Develop a Sugar Addiction? Sugar consumption can create a short-term high and spark of energy in the body. Some studies have suggested sugar is as addictive as cocaine. People often enjoy the dopamine release sugar brings. However, due to the addictive nature of sugar, long-term health effects like obesity and diabetes are as a risk of sugar overindulgence. Similar to other compulsions or behavioral addictions, sugar addiction is a special risk for people with low moods, anxiety and stress. Additionally, people who suffer from constant tiredness may reach for carb-rich sugary foods. Sugar releases endorphins in the body and combines with other chemicals in the body, resulting in a surge of energy. Once someone mentally connects sugar with help providing energy, they may become dependent on it, usually inadvertently. People may begin to crave sugar to balance irritability, emotional lows, and other conditions. Eventually, there is little control over avoiding sugary foods, and a sugar addiction has developed. Unlike many other substance use disorders or behavioral compulsions, sugar addiction is often easy to spot. The clearest signs of sugar addiction involve consumption of large amounts of food or drinks laden with sugar. The individual may eat constantly, eat to combat boredom, and become hyper and crash. They may even talk about craving sugar after stressful or irritating life experiences. People may find sugar’s ability to provide instant energy combined with the good taste of sugary foods appetizing. Sugar provides some with a “quick fix” for a long and stressful day. People who are enduring breakups or other emotionally stressful situations often turn to chocolate or pints of ice cream to comfort themselves during the difficult time. However, those who turn to sugar to deal with emotional issues are more likely to become addicted. Other indications of sugar addiction for emotional relief are weight gain and difficulty focusing on daily responsibilities. In turn, this can damage self-esteem, cause feelings of helplessness, and lower self-worth, which in turn leads to more sugar consumption and a more severe addiction. A particularly worrisome aspect of sugar addiction is binge eating. Binge eating is eating too much and too rapidly, followed by feelings of guilt, shame, and disgust. This can include a focus on sweets for the same effect of binge eating non-sugary foods—emotional regulation and self-medication. It is critical to remember that food, especially sugar, is a short-term fix for emotional conditions. If you or someone is struggling with depression and using food as a crutch, consider therapy or rehab. Anxiety and sugar craving have a direct relationship. Eating disorders like binge eating or anorexia occur for underlying reasons. Often times, the person suffering such disorders is struggling for psychological and emotional reasons. Stress eating is common example of the relationship between eating disorders and anxiety, and sugar consumption is commonly associated with stress eating. Anxiety causes the stress hormone cortisol to be released in the body, and for some, that means not being hungry. For others, the stress may encourage people who already like sugar into more cravings. In cases of sugar addiction coupled with eating to soothe anxiety, the end result is typically weight gain. Despite sugar initially boosting serotonin levels in the brain, sugar can worsen anxiety as sugar lows create feelings of fatigue and depression. There is a surprising genetic link between children of parents who abuse alcohol and their sugar addiction. A recent study confirmed dopamine receptors in the brain light up when we consume sugar, similarly to the receptors lighting up in the brain of someone who abuses alcohol. This can encourage people who struggle with sweets into alcoholism or moderate alcohol consumption. Alcohol-dependent individuals have a higher preference for sweets and experience sugar cravings and sugar withdrawals. The gene in parents who abuse alcohol, as well as their preference for sugar, gets passed down to their children. As a result, the child now has a predisposition to both of these compulsions. 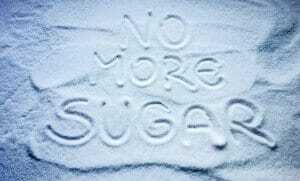 Many who eliminate sugar from their diet find themselves experiencing withdrawal symptoms of irritability, fogginess, moodiness, and low energy. Since many struggling with sugar addiction have binged on sugary foods, withdrawal and cravings can be intense. Tragically, many choose to go back to eating sugary foods for the chemical release in the brain. A much better alternative is to do a dietary swap, whereby the sugar user exchanges unhealthy sweets for natural and healthy options to regain control. Change begins with realizing there is a problem with one’s sugar addiction. Secondly, modifying one’s diet, as well as self-control can help, but going cold turkey isn’t ideal. Someone with a sugar addiction, especially if they have another substance abuse disorder or a co-occurring mental health condition, will likely have difficulty in purging themselves of cravings. If you or someone you know has a sugar addiction, especially if complicating factors are present, please contact a dedicated treatment specialist today to find out more about your options.